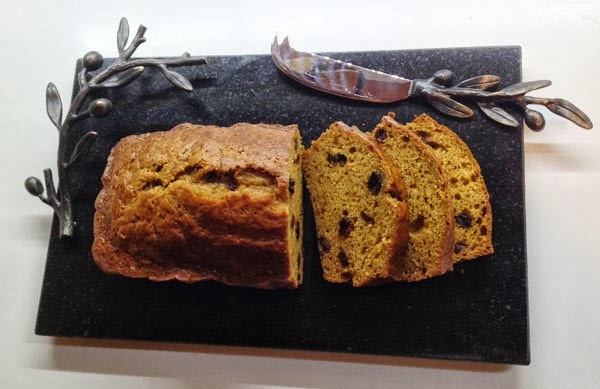 I've been making this recipe for Pumpkin Bread over 20 years and have tried a lot of different variations, but this one is always hands-down the best. And, it's low fat and it just doesn't get any better than that. It's super moist and great for breakfast, a snack or dessert with a scoop of vanilla. I'll take this over pumpkin pie any day! My family and friends will tell you that I'm crazy about making pumpkin bread. I make it year-round and give it as gifts (A LOT) ... so much so that I'm sure everyone is wondering when I'll make something new! Well, not until I create or find a recipe that is consistently as awesome as this one! Whisk or sift together flour, salt, baking soda, cinnamon and nutmeg in a medium mixing bowl. Set aside. Using a Kitchenaid mixer or hand mixer, combine sugar, pumpkin, eggs, oil, applesauce; mix well. Add flour mixture to wet mixture a little at a time and mix until well blended. Bake for 50-55 min or until toothpick comes out clean. Cool on wire racks for 5 minutes; remove from bread pans and cool completely. I highly recommend using turbinado sugar over white sugar in this recipe. It adds a wonderful caramelized flavor and is heads above white sugar. Trust me ... I've tried and received groans from my husband when I've substituted white sugar. I use the disposable 8" eco-foil or ez-foil bread pans and they make a HUGE difference in how the bread comes out. With a larger, commercial pan, the edges of the bread tend to cook more quickly before the center is done and half the bread comes out tougher. The key to evenly moist bread is using two of the smaller disposable pans. And, I wash and reuse them so they are super economical and environmental friendly!